Rosamond, California: Over 60 drivers competed last weekend at Willow Springs Balcony for Just Drift’s 2015 Top Drift competition. The diverse field of cars ranged from a BMW E36 sporting a Ford 302 motor, to a Nissan 200sx with a heavy breathing LT1 under the bonnet and everything in between. The mainstay judges Hiro Sumida and Taka Aono would be accompanied by Ryan Litteral, who was filling in for Justin Pawlak. The competition quickly heated up as the modified configuration of the Balcony track, would prove challenging for all. During the tandem battle, competitors were not afraid to trade paint as cars would enter the course nose to tail. 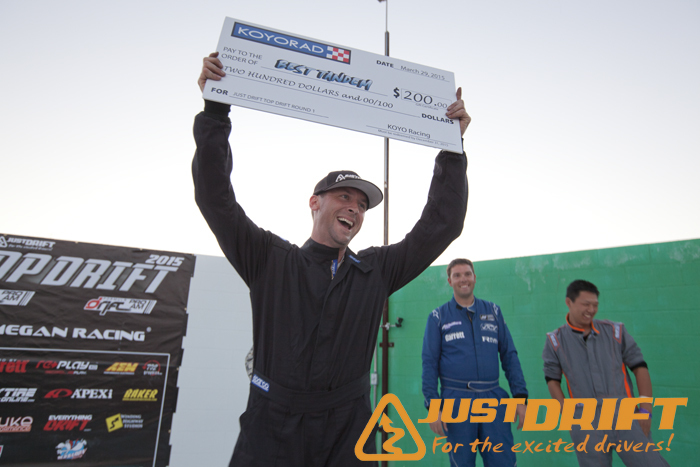 Dust settling, and cars pushed to the limit, Joe Tardiff would have to relinquish third place to Jason Kim after suffering from a vehicle malfunction; which left Adam Knapik and Eric Hill to battle for first and second place. The two cars crept off the line while both drivers sized each other up. As the cars surpassed the pace cone, both 240sx’s came alive as their LS platformed V8 bellowed into the sunset. Arguably one of the closer battles, both cars entered in a near perfect tandem along the k-rail section with tire smoke and engine roars rising off the walls. When the wind finally carried the smoke off the track, the judges came to a decision, awarding Adam Knapik first place and Eric Hill second place. 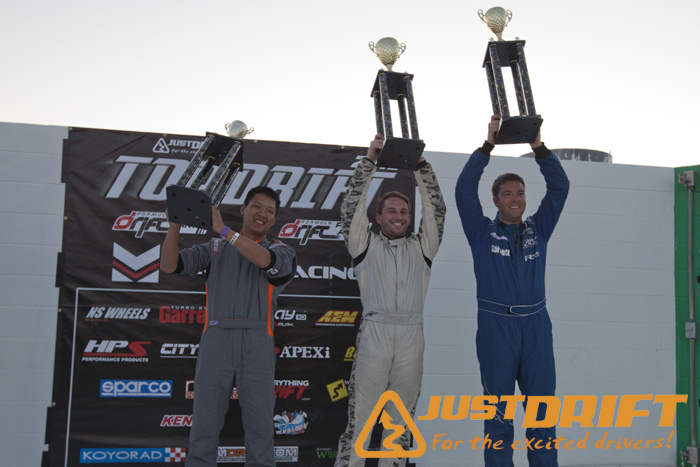 Just Drift is excited to watch the 2015 Top Drift Season start off with another strong season full of talented drivers. We would like to thank our sponsors: Megan Racing, Sparco, HPS Silicone Hoses, Koyo Radiators, Kenda Tires, NS Wheels, Red Baron Racing, AEM Electronics, Garrett Turbo, Nuke Performance, Willow Springs Raceway, ReplayXD, for their continuing support of the series. Adam Knapik S14 – SOLO SHOT FOR 1ST PLACE! Drivers race car parking – You may park at the access road on one side where it’s mark PIT AREA. Just leave the other side of the access road open at all times. This is a modified parking we’re allowed to use by WSIR. Pass the orange line will be cars with permist only. Everyone else will not be allowed. $200 Goes to the winner of Best Tandem Battle of the day! You don’t have to be on the podium to win some cash! – Only the winner of the best tandem receives $200 cash from Koyo! JUSTDRIFT | admin March 17, 2015 | Comments Off on BEST TANDEM! BY KOYO-RAD!